Parrot Disco-Pro AG is the all-in-one multi-purpose drone solution for farmers, agriculturalists, and small cooperatives that fits in their everyday tool box to help them improve the Return on Investment (ROI) of their crops. It is a multipurpose farming solution that can handle effectively many types of agricultural needs deployed for a range of issues arising in a farm. This end to end solution allows farmers and small agriculture cooperative to have easily and quickly insights regarding the health of their crops. 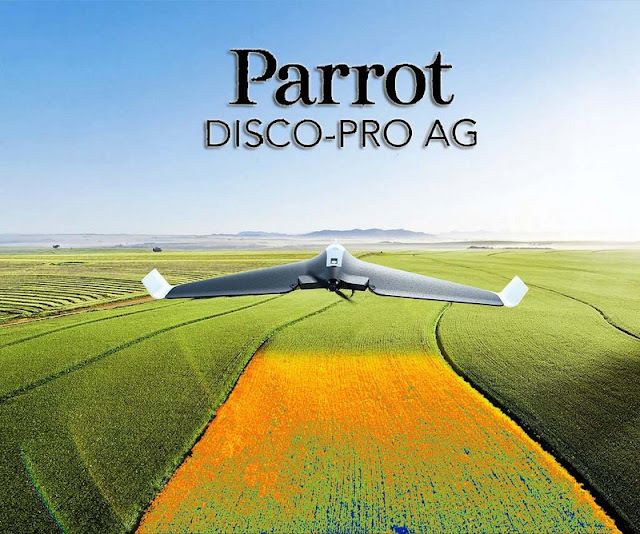 The Parrot Disco-Pro Ag offers many features including visual crop scouting and specialized NDVI maps which can be generated using Pix4DMapper Pro/AG. It is the easy to use and reliable solution that allows you to quickly identify problem areas and take the needed steps accordingly. 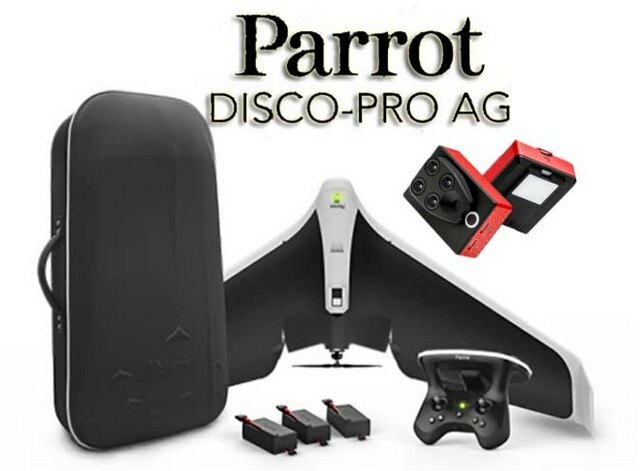 The Parrot Disco Pro Ag for sale is priced $4,499.00. Parrot Disco-Pro AG is very easy to operate and its performance is quite reliable due to which there is an affinity towards using it considerably. The enhanced aerodynamic design of the drone is very effective in helping it with a smooth flight and the advanced autopilot mode makes it very easy to pilot, reliable, and safe for the user to operate it without any issue. It is one of the fixed-wing drones that are available for the purpose and comes fitted with a powerful motor. The high capacity battery of the drone allows to help in covering a vast area in a single flight of at least 80 hectares (200ac) at 400 feet (120m) flight altitude. The area covered by the drone can be understood much better because different flight plans can be created that can show different ways of covering the complete area. There are many benefits of using this fixed-wing drone device, one of which is the new Parrot Skycontroller 2. The Skycontroller helps in getting an optimized and secure Wi-Fi connection so that communication can be made with the drone in the best possible manner. There is also an option of live video streaming of the drone’s operation on a mobile device by using the FreeFlight pro app. This can be quite convenient for a lot of users so that they can easily personalize mapping parameters like overlap and flight altitude. Pix4Dcapture becomes the first flight planning app in the market to support a fixed wing drone. It can help in creating advanced flight paths within a defined area through the smartphone itself without any additional hardware. Customize area mapping parameters like flight altitude and overlap according to your needs. Control the whole flight paths from the frontal camera of the Parrot Disco-Pro directly in Pix4Dcapture. The automatic generation of flight paths can be a very convenient way of understanding how to map a particular area and it can also provide a good insight into the complete area for different ways in which it can be successfully mapped as per choice. Pix4Dcapture is an app that has been made keeping in the planning of flight missions for mapping crop fields using smart handheld devices. It also reduces the need for any other hardware support that can be quite cumbersome to carry at times. So that effective mapping can be done by it. AIRINOV First + is the powerful and easy to use agricultural cloud mapping platform that processes the captured crop data into actionable insights so that future activities can be planned as per report. These two utilities can help in finding out all about an area and consequently help in increasing the farm produce of a crop. The process of using Airinov First has also been kept very simple. In 3 easy steps: create your account, upload the photos to the cloud and generate your actionable AIRINOV report. Detailed zoning map to help do Variable Rate Application and help in the agricultural process. Therefore, Airinov First + NDVI maps and other technological advancements are very useful for getting all the needed details regarding the piece of land. Moreover, the speed with which all this data can help substantially in planning and increase the production and improve upon the RoI of a farm. 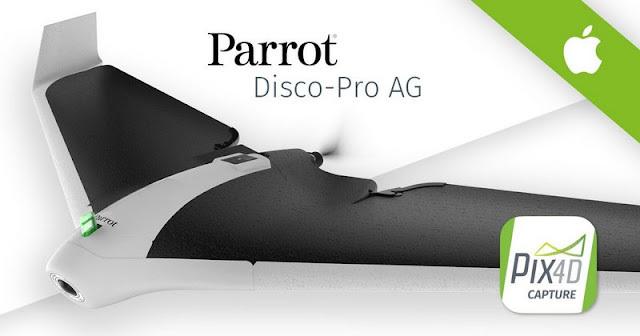 Before we delve further into the Parrot Disco Pro Ag and look at its other important specifications and features, it is important here to find out all the contents that can be expected upon a purchase. On buying the drone, a customer can expect to receive the following package items. Parrot Disco-Pro AG Drone – 01 no. USB – micro-USB cable – 01 no. The User Guide for Parrot Sequoia -01 no. Parrot Sequoia – 01 no. Skycontroller 2 – 01 no. 2 Chargers 3 country adapters. Country Adapters – 03 nos. Start Guide – 01 no. One Year subscription of AIRINOV First + agricultural cloud mapping platform. Buy your Parrot Disco Pro Ag Drone from reputable online drone retailers, and have confidence that you are dealing with UAV experts that offer best prices and support. And they also have a team of technicians who can handle most warranty issues locally, as well as repairs, maintenance and upgrades. After getting these package items, it is very important to read user guide correctly through them in a very detailed manner. The Parrot Disco-Pro AG is one such fixed-wing drone that can definitely help to improve the farm products by providing reports and data on which you can work thoroughly to gain an advantage regarding a crop yield. Process and analyze data with the intuitive cloud mapping solution AIRINOV FIRST+: get insights of your crops with NDVI maps. 0 Response to "The Parrot Disco Pro Ag for Sale - Drone Solution to Improve RoI of a Farm"